I finished the model for Lisa today, so I decided to start something new! 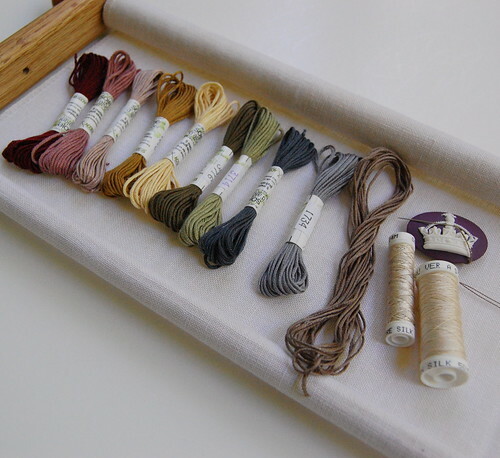 It's Drawn Thread's Sampler of Stitches. I really fell in love with this project after seeing Chi's finished Sampler. Her whole album is such an inspiration! I put a few stitches in yesterday after getting a few silks I was needing from It's a Stitch. AVAS Soie d'Alger silk, 32 ct. Vintage Bisque by Lakeside Linens. I left the last number off the year because who knows when I'll actually finish. I am hoping it's sometime in the 2010's. 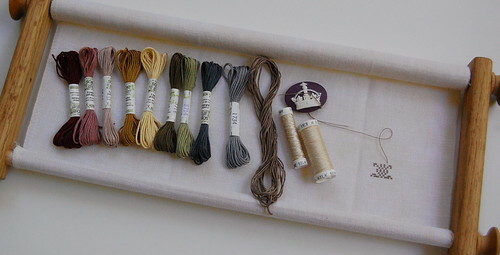 :) I was going to use NPI silks, but decided to go with AVAS because they're a little thicker and thought they might work better on the 32 ct. linen. Nice! Thanks for the link to Chi's picture -- it is impressive! I love your new start -- and all the silks laid out on the fabric make me happy! lol! Ooo, this will be a fun one to watch your progress on. Beautiful pattern and the silks are wonderful. Nice start, Nicole. 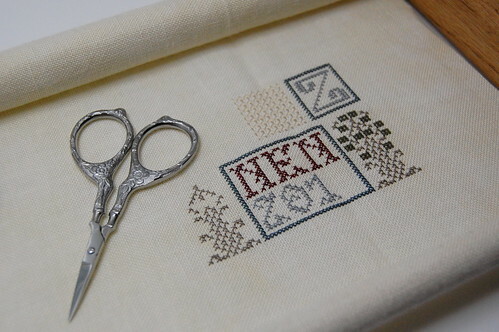 What a beautiful pattern to stitch. I really like that cream silk. I checked out her album, you are right she really has some beautiful work in there. Another lovely new start. Can't wait to see your progress. I did Sampler of Stitches and just loved working on it. I did it as each section was released and I have to tell you that I hated waiting for them - I wanted to do it all at once. You're going to have a wonderful time with it. How beautiful is that..love the silks! Lovely start! Here's another one I really want to stitch, siiiiighhhh - where can I buy cans of time? Very pretty, Nicole! I like all of the interesting motifs. Vintage Biscuit is perfect for that. And Chi's finished piece certainly is an inspiration. Great new start! Love the colors! We all love a new start, don't we? I'm also looking for the next project after my Berry one by BBD... More trouble or fun? It's very pretty, what are your AVAS colors? I also like their coverage better than NPI silks on a larger count linen. What an ambitious project. Can't wait to see more. Wow! This is going to be gorgeous. Do you know if "Chi" has a blog? You are right, her albums are amazing! I have half of these charts, and hope to do this one...some day. I'm sure seeing your photos will spur me on.